Perfect solutions for that awkward under bathroom sink storage area. Get your toiletries, cleaning products and other bathroom related items organised more easily with these fantastic ideas and inspiration. They are often the place that things get stuffed, only to fall out all over the place when we need to find anything. The space is awkward, often involving working around pipes from the sink – and it can feel just too hard to get it working as hard as possible for you. And that’s where this post comes in! 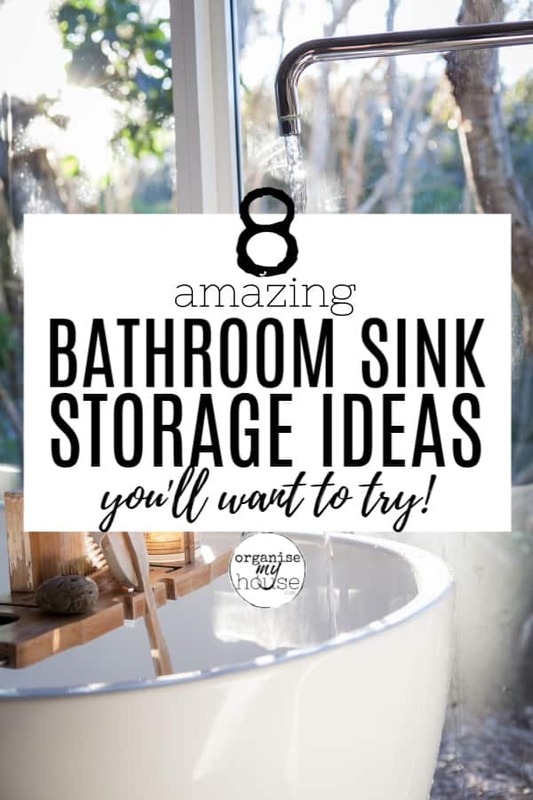 I wanted to look at all the different ways to organise under your bathroom sink – so that you can find what you need, so you can store as much as possible there, and so that it works for you and your family. If you don’t already have storage under your sink then you’ll want to get some – so you can utilise all the solutions below. Having under sink storage makes sense in so many ways, because you will have things easily accessible for you each and every day – and it’s a great way to make the room look tidier if you currently have everything out and visible. Some storage cupboards don’t have any shelves already fitted, usually because this can be quite complicated as they need to fit around the pipework below the sink. As such, you may want to consider adding shelving into the cupboard to maximise the storage you have available. Did you know that there are specific under sink shelves available on the market?. These can be fitted to go around the sink, and then you can either just add your stuff directly onto the shelves, or (my personal favourite), add baskets to the shelves and categorise the items in each one. If you’re not keen on adding shelves as the last point suggested, then another fantastic idea that uses the height of the space really well is to simply hang a tension rod at the top of the cupboard. You can then use this to hook things over really easily – and they’re quick to grab when you need them. Whether you have in-built shelves already in place, or no shelves at all, baskets can be a really quick and easy way to group your stuff together. Try and get baskets that use the space to it’s best i.e. full depth and max. height available. If you do this then you can see what you have (as baskets tend to have open tops), and can also label if necessary. These are a fantastic way of maximising the height of the space – and because of this are especially good if you don’t already have shelves in the storage you’ve got and don’t want to fit any. They also allow more categories of items to be stored which makes things easier to find. I love these, and already use them in my kitchen a lot – but have never thought before to use them in the bathroom. They make total sense as you can spin them around to get access to what’s at the back. Just note that you DO lose a little space around them as they are circular – but the easy access outweighs this for many people. You can also get double level lazy susans’ which can make the most of the height of the space as well. Last but definitely not least is to utilise the back of the cupboard door. This is often forgotten about, but with some careful planning this space is a goldmine for easy and accessible ideas. This is the simplest option, and the hooks can house things like a hairbrush (if it has a small hole in the end), your hair dryer or straightener, face clothes, a toiletry bag, cleaning gloves etc…. Great for adding all those little bits and bobs that have no other places. I specifically like the idea of adding in your hair dryer / straightener etc… in this way because they are awkwardly shaped items, with wires and all sorts to contend with – and storing them out of sight but easy to grab and put away makes so much sense. Why not have all your nail varnish in plain sight? It’s shallow so won’t stick into the cupboard when the door is closed (if that space is tight for you), and all those colours would make a great display! You can buy magnetic stick on sheets that work amazingly well to house those small metal objects such as hair pins, tweezers, small scissors etc…. So there you have it – 0ver 8 simple but Oh! 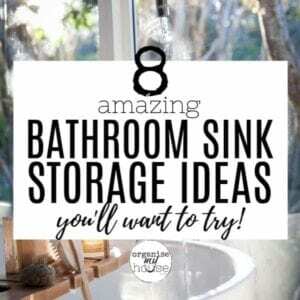 so effective under bathroom sink storage ideas to try now. I can’t wait to hear how you get on, as I’m sure there’s at least one new idea in this selection that will really change how useful this storage area is. Previous Post: « BOSCH GLASSVAC REVIEW – WHAT IT IS, WHAT IT DOES, + MUCH MORE!